Enjoy HOSPITAL MILLIONS, the pre-ACO version of our interactive Board game of investment and shameless speculation: fun and education online for up to four players. Following the successful conference in Birmingham on November 17, Health Campaigns Together in collaboration with the Socialist Health Association, the National Pensioners Convention and others has launched a campaign. Conference reports, background facts, figures, etc available HERE. A leaflet (2 sides of A5) on social care can be downloaded HERE in pdf for printing. 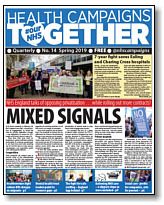 Printed copies are available from the Keep Our NHS Public Office in quantities from 10 to 500, at a cost of £1 - £8 for post and packing. Please email KONP. After 25 years of costly failure, PFI has now been abandoned by Labour and Tory parties. 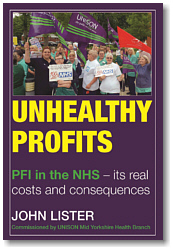 Unhealthy Profits, a full-length book on PFI is available to download as an ebook from Amazon for £7.50, or £9.99 in paperback form. A showing of Banner Theatre's production on the NHS. In 1948 the NHS was established, offering health care free for all at the point of delivery. 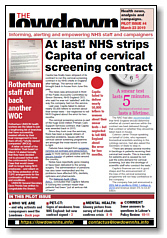 • How NHS policies are affecting patients and healthcare workers. • How we can join together to challenge the hostile environment in the NHS. This will be the first joint health & social care HCT Conference. NHS England's proposals for new legislation mean business as usual Short statement and longer more in depth analysis of proposals on which NHS England has sought "engagement" with the public and campaigners, developed by KONP and HCT. The two statements make clear that the only NHS England proposal that can be supported the way it is argued is the call for repeal of the controversial "section 75" of the 2012 Health and Social Care act and the associated regulations designed to compel Clinical Commissioning Groups to carve up services and put them out to tender. KONP and most campaigners fought this legislation every step of the way as it was forced through Parliament by David Cameron's coalition with Lib Dem support, so there is no sensible reason why we would now oppose it being scrapped. Theresa May's post-Brexit immigration plan could close a quarter of services in some hospitals say health bosses due to nurse shortages Daily Mail recycles Telegraph story highlighting potential impact of £30k minimum salary for migrants coming to UK. How to fund social care? What are the different options for funding social care? The Nuffield Trust offers a tool to help direct further investigation. Collapsed private provider to the NHS owes £11m (£) HSJ article on collapse of Coperforma the disastrous private provider of patient transport services brought in by Sussex CCGs -- before a predictable collapse. "Clinical commissioning groups in Sussex ... have claimed the company owes them £7.6m. In a statement, the county’s CCGs said: “The Sussex CCGs are actively pursuing all options to maximise recovery for the NHS of costs incurred as a result of the failure of the patient transport service contract." "•The proportion of people waiting over 18 weeks to start elective treatment reached 13% in February 2019. It has been three years since the referral-to-treatment target was last met. •In February 2019, 2.3% of patients had been waiting over 6 weeks for a diagnostic test, which is a 1.3 percentage point drop on the previous month but 44% higher than it was in February 2018. •In February 2019, 23.9% of patients waited longer than two months to start their first treatment for cancer following a GP urgent referral. This is a small 0.1 percentage point increase on the previous month, but over 4.8 percentage points higher than in February 2018." Telford hospice funding cuts 'heartbreaking' BBC report. Telford CCG shows more contempt for provision of services outside hospital by deciding to cut £250,000 of funding to a hospice. The decision is "heartbreaking" and "flawed", its supporters have said. Telford and Wrekin Clinical Commissioning Group (CCG) said it was a "difficult decision" to make the cut to its £1m grant, resulting in a loss of two beds at Severn Hospice in Telford. Staff at the hospice said they were "extremely disappointed" by the decision. National trade union affiliates now include UNISON, Unite, GMB, The PDA Union (Pharmacists) NEU (Teachers’ union), FBU and RMT. But for strong campaigning we also need local union branches and regional bodies to affiliate, along with campaigners. The Green Party has also affiliated - and we welcome CLPs and other Labour Party bodies. HCT remains non-party, but very political - join us now!